American fantasy Novelist “Terry” Brooks was born January 8, 1944 in Sterling, Illinois. He is an alumnus of Hamilton College, earning his B.A. in English literature in 1966. He later obtained a J.D. from Washington and Lee University. He was a practicing attorney before becoming a full-time author. Brooks had been a writer since high school, writing mainly in the genres of science fiction, western, fiction, and non-fiction. He started writing in his early college life, after he was given a copy of The Lord of the Rings by J. R. R. Tolkien, which inspired him to write in one genre. While Tolkien inspired the genre, Brooks stated at the Charlotte Literary Festival that he credits the inspiration of his style of writing to William Faulkner’s works. With this inspiration, he then made his debut in 1977 with his first epic fantasy novel The Sword of Shannara. The Sword of Shannara saga has continued to this day, with the Legends of Shannara, First King of Shannara, The Heritage of Shannnara, The Voyage of the Jerle Shannara Trilogy, The High Druid of Shannara trilogy and the latest installment The Measure of the Magic which was released in August of 2011, as well as a prequel, First King of Shannara. The series blends magic and primitive technology and the books are set in the Four Lands which in some books is identified as Earth long after civilization as we know it was destroyed in a chemical and nuclear holocaust called the Great Wars. By the time of the prequel First King of Shannara, the world has now reverted to a medieval state and magic has re-emerged to supplement science as humans and other races live in a place known as the Four Lands, which is a future North America. Further into the novels science starts to become more advanced. Brooks also wrote the Landover novels and then wrote a four-book series titled The Heritage of Shannara.For the next fourteen years, he wrote more Landover books, then went on to write The Word and Void trilogy. Continuing the Shannara series, Brooks wrote the prequel to The Sword of Shannara, titled First King of Shannara. He then wrote two series, The Voyage of the Jerle Shannara and High Druid of Shannara and recently finished a third, Genesis of Shannara, a trilogy bridging his Word and Void and Shannara series. His latest project, A Princess of Landover, was released in August 2009. 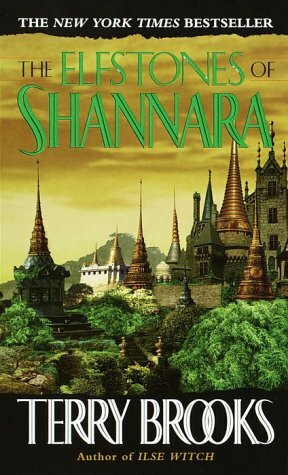 Legends of Shannara, a duology taking place after the events of Genesis of Shannara, was recently completed. The first part, entitled Bearers of the Black Staff, was released in August 2010. The second installment, The Measure of the Magic, was released in August 2011. During his writing career, Brooks has written 23 New York Times bestsellers, two movie novelizations and is one of the biggest-selling living fantasy writers. Dame Shirley Bassey, DBE was born 8th January in 1937). She found fame in the late 1950s and is best known for recording the theme songs to the James Bond films Goldfinger, Diamonds Are Forever, and Moonraker and is a UNESCO Artist for Peace. She attended Moorland Road School where her strong voice. was noticed by teachers and students alike She also sung in the school choir. After leaving Splott Secondary Modern School at the age of 14, Bassey first found employment packing at a local factory while singing in local public houses and clubs in the evenings and weekends. In 1970 Bassey released the album Something, (The single of the same name was more successful in the UK charts than the original Beatles recording – the only artist to have achieved this) plus the singles “For All We Know”and “Never Never Never”. She also released the albums Something Else, And I Love You So, , I Capricorn, Never Never Never, Good, Bad but Beautiful, Love, Life and Feelings, You Take My Heart Away and Yesterdays. Two compilations, The Shirley Bassey Singles Album (1975) and 25th Anniversary Album (1978) were also released. Between 1970 and 1979, Bassey had 18 hit albums in the UK Albums Chart.In 1973, her sold-out concerts at New York’s Carnegie Hall were recorded and released as a two-LP set, Shirley Bassey: Live at Carnegie Hall. This album and the majority of her recordings from this period have been re-mastered and released on CD by EMI and BGO Records. In 1971, she recorded the theme song for the James Bond film Diamonds Are Forever, which also featured as part of Sydney’s 2007 New Year’s celebration.In 1976 & 1979 Bassey starred in the Shirley Bassey Show which featured guests including Neil Diamond, Michel Legrand, The Three Degrees and Dusty”. in 1979 Bassey sung her third title theme for the Bond films, Moonraker. Throughout most of the 1980s, Bassey focused on charitable work and performing occasional concert tours throughout Europe, Australia, and the United States. In 1982 Bassey recorded an album entitled All by Myself and made a TV special for Thames Television called A Special Lady with guest Robert Goulet.In 1986, she released a single and video to support the London Tourist Board, “There’s No Place Like London”and in 1987 she recorded an album of James Bond themes, The Bond Collection. She also provided vocals for Swiss artists Yello on “The Rhythm Divine” and her 1991 album Keep the Music Playing displayed a grand, operatic pop style. In 1994 EMI released the five-CD box set Bassey – The EMI/UA Years 1959 – 1979. In 1996, Bassey collaborated with Chris Rea in the film La Passione, appearing in the film as herself and releasing the single “‘Disco’ La Passione”, the remix proving a major club hit throughout Europe. In 1995 Bassey colaborated with The Propellorheads and released “History Repeating“. Bassey celebrated her 60th birthday in 1997 with two open-air concerts, at Castle Howard and Althorp Park, and another TV special, then in 1998 Bassey performed for a benefit at an open air concert close to the Sphinx and the Great Pyramid in Egypt. Bassey was one of three central figures In the 1998 film Little Voice, along with Marilyn Monroe and Judy Garland. The following year, she performed the official song for the rugby World Cup, “World in Union”, with Bryn Terfel at the opening ceremony at The Millennium Stadium, Cardiff and also contributed two more songs to the official album Land of My Fathers. In 2001, Bassey was principal artiste at the Duke of Edinburgh’s 80th Birthday celebration. On 3 June 2002 Shirley Bassey was one of a prestigious line up of artists including Elton John, Paul McCartney, Queen, The Corrs, Annie Lennox, Eric Clapton, Tony Bennett, Cliff Richard, Joe Cocker, Rod Stewart, Ricky Martin, Phil Collins and Tom Jones who performed at the Queen’s 50th Jubilee Party at Buckingham Palace. A gala charity auction of her stage costumes was also held at Christie’s, called Dame Shirley Bassey: 50 Years of Glittering Gowns, it raised £250,000 (US$500,000) for the Dame Shirley Bassey Scholarship at the Royal Welsh College of Music and Drama and the Noah’s Ark Children’s Hospital Appeal. Bassey also topped the bill at the 2005 Royal Variety Performance, introducing her new song “The Living Tree”. Bassey also performed at five arenas around the UK culminating at Wembley & also performed a concert in front of 10,000 people at the Bryn Terfel Faenol Festival in North Wales. Bassey performed a 45 minute set at the 2007 Glastonbury Festival wearing a pink Julien Macdonald dress, and customised Wellington boots and also released A new album, Get the Party Started. Bassey performed “Big Spender” with Elton John at his annual White Tie and Tiara Ball to raise money for The Elton John AIDS Foundation. In 2007, Bassey performed in Fashion Rocks in aid of The Prince’s Trust at the Royal Albert Hall. Throughout her long and distinguished carreer Dame Shirley Bassey has won many awards for her music. In 1974 she was voted Best Female Entertainer by the American Guild of Variety Artists. In 1976 she won the EMI Award for twenty years as a recording artist. In 1977 she won a BRIT Award for being Best British Female Solo Artist in the previous 25 years. In 1977 she garnered a Golden Rose of Montreux nomination. In 1991 a plaque unveiled in Rotterdam’s Walk of Fame, Star Boulevard, Commemorating Dame Shirley Bassey. In 1993 Bassey was awarded a CBE (Commander of the Order of the British Empire) in the New Years honours List and in 1995 she won the Variety Club of Great Britain’s award for Showbusiness Personality of the Year, In 1997 she recieved a Grammy nomination for the The Birthday Concert (recorded live at Althorp Park) and in 1998 she was also given an award for the Longest run by a solo artist at th Royal Festival Hall, London. on 31 December 1999 . Bassey was created a Dame Commander of the Order of the British Empire (DBE) by Queen Elizabeth II “For services to entertainment” and was invited to perform in 2002 at the Party at the Palace, a public celebration of the Queen’s Golden Jubilee. She was awarded France’s top honour, the Legion d’Honneur.She is also the Most Successful British Female Singer according to the Guinness Book of Records. She was given an award for Outstanding Contribution to Music at the National Music Awards, UK and in 2003 she was given a Lifetime Achievement Award (inaugural award) – Western Mail Welsh Woman of the Year. in that same yearShe also became UNESCO’s Artist for Peace and in 2005 a Plaque was unveiled on the Avenue of Stars in London and In 2008 the song “Goldfinger”was inducted into the Grammy Hall of Fame. English musician, actor, record producer and arranger David Bowie A.K.A David Robert Jones was born on this day 8 January in 1947. He has been A major figure for over four decades in the world of popular music, and is is also regarded as an innovator, particularly for his work in the 1970s. He is known for his distinctive voice, and the intellectual depth and eclecticism of his work. The Late, Great Graham Chapman would have celebrated his birthday on 8th January had he not tragically died in 1989. He started out in the 1960′s writing professionally for the BBC alongside John Cleese, initially for David Frost, but also for Marty Feldman. Chapman also contributed sketches to the BBC radio series I’m Sorry, I’ll Read That Again and television programmes such as The Illustrated Weekly Hudd (starring Roy Hudd), Cilla Black, This is Petula Clark, and This Is Tom Jones. Chapman, Cleese, and Tim Brooke-Taylor later joined Feldman in the television comedy series At Last the 1948 Show. There, Chapman displayed a gift for deadpan comedy (particularly evident in the sketch “The Minister Who Falls to Pieces”) and for imitating various British dialects. Chapman and Cleese also wrote for the long-running television comedy series Doctor in the House. Chapman also co-wrote several episodes with Bernard McKenna and David Sherlock. 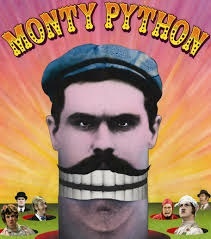 After reuniting with the other Pythons in Monty Python’s The Meaning of Life, Chapman began a lengthy series of American college tours where he would tell the audience anecdotes about Monty Python, the Dangerous Sports Club, Keith Moon, and other subjects. In 1988, he appeared in the Iron Maiden video Can I Play with Madness. Chapman also secured funding for his much cherished pirate project Yellowbeard in 1982. Once again, Chapman collaborated with writer Bernard McKenna and for the first time with Peter Cook. The film, which starred Chapman as the eponymous pirate, also featured appearances from Peter Cook, Marty Feldman, Cleese, Idle, Spike Milligan, and Cheech & Chong. It marks the last appearance of Feldman, who suffered a fatal heart attack during shooting. It was released in 1983 to mixed reviews. His final project was to have been a TV series called Jake’s Journey. Although the pilot episode was made, there were difficulties selling the project. Chapman was also to have played a guest role as a television presenter in the Red Dwarf episode “Timeslides”, but died before filming was to have started. Steve Clark, the former Guitarist with Def Leppard sadly passed away on 8th January 1993. Formed in 1977 in Sheffield as part of the New Wave of British Heavy Metal movement.Def Leppard ’s strongest commercial success came between the early 1980s and the early 1990s. Their 1981 album High ‘n’ Dry was produced byRobert John “Mutt” Lange, who helped them begin to define their style, and the album’s stand out track “Bringin’ On the Heartbreak” became one of the first metal videos played on MTV in 1982. The band’s next studio album Pyromania in 1983, with the singles Photograph and Rock of Ages, turned Def Leppard into a household name. In 2004, the album ranked number 384 on Rolling Stone’s 500 Greatest Albums of All Time. 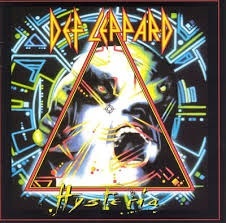 Def Leppard’s fourth album Hysteria, released in 1987, topped the U.S and UK album charts. As of 2009 it has 12x platinum sales in the United States, and has gone on to sell over 20 million copies worldwide. 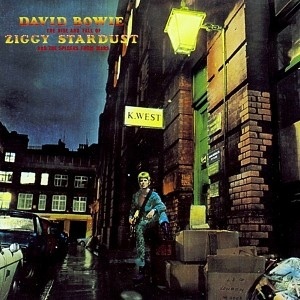 The album contained loads of great songs, including the U.S. Billboard Hot 100number one “Love Bites”, alongside Pour Some Sugar on Me , “Hysteria”,Armaggeddon It , “Animal” Rocket“., Gods of War and Women. Sadly though Clark died 8 January 1993 however he was eventually replaced by Vivian Campbell who has remained with Def Leppard ever since. Their next studio album Adrenalize reached number one on the U.S. Billboard 200 and UK Album Chart in 1992, and contained several hits including, “Let’s Get Rocked” and “Have You Ever Needed Someone So Bad”. Their 1993 album Retro Active contained the acoustic hit song “Two Steps Behind”, while their greatest hits album Vault released in 1995 featured track “When Love & Hate Collide. Def Leppard’s latest album Def Leppard was released in 2015 as part of a limited edition Fan Pack containing Magazines, Prints, a keyring as well as a CD of the album itself. The album contains the tracks: Let’s Go, Dangerous, Man enough, Invincible, Sea of love, Energized, All time High, Battle of my own, Broke and Broken-hearted, Forever young, Last dance, Wings of an Angel, Blind Faith, We Belong (alternate vocal), Let’s go (UK Radio edit). Often referred to as the “King of Rock and Roll” or simply “the King”, Elvis Presley was born 8th January, 1935 in Tupelo, Mississippi. At the age of 13 Presley moved to Memphis, Tennessee, with his family and began his career there in 1954, working with Sun Records owner Sam Phillips, who wanted to bring the sound of African American music to a wider audience. Accompanied by guitarist Scotty Moore and bassist Bill Black, Presley was one of the originators of rockabilly, an uptempo, backbeat-driven fusion of country and rhythm and blues. Presley’s rise to national attention in 1956 transformed the field of popular music and had a huge effect on the broader scope of popular culture. Presley’s first RCA single, “Heartbreak Hotel“, was released in January 1956, and was a number one hit. He became the leading figure of the newly popular sound of rock and roll with a series of network television appearances and chart-topping records. His energized interpretations of songs, many from African American sources, and his uninhibited performance style made him enormously popular—and controversial. In November 1956, he made his film debut in Love Me Tender. He was Conscripted into military service in 1958, and relaunched his recording career two years later with some of his most commercially successful work. He staged few concerts however, and guided by Colonel Tom Parker, he proceeded to devote much of the 1960s to making Hollywood movies and soundtrack albums, most of them critically derided. In 1968, after seven years away from the stage, he returned to live performance in a celebrated comeback television special that led to an extended Las Vegas concert residency and a string of profitable tours. 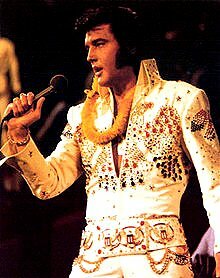 In 1973 Presley staged the first concert broadcast globally via satellite, Aloha from Hawaii, seen by approximately 1.5 billion viewers. Presley is regarded as one of the most important figures of 20th-century popular culture. He had a versatile voice and unusually wide success encompassing many genres, including country, pop ballads, gospel, and blues. He is the best-selling solo artist in the history of popular music. Nominated for 14 competitive Grammys, he won three, and received the Grammy Lifetime Achievement Award at age 36. He has been inducted into multiple music halls of fame, and is regarded As the catalyst for the cultural revolution that was rock and roll, he was central not only to defining it as a musical genre but in making it a touchstone of youth culture and rebellious attitude. His name, image, and voice are instantly recognizable around the globe, and in In polls and surveys, he is recognized as one of the most important popular music artists and influential Americans. “Elvis Presley is the greatest cultural force in the twentieth century”, said composer and conductor Leonard Bernstein. “He introduced the beat to everything and he changed everything—music, language, clothes. It’s a whole new social revolution—the sixties came from it.” Bob Dylan described the sensation of first hearing Presley as “like busting out of jail”. A New York Times editorial on the 25th anniversary of Presley’s death observed, “All the talentless impersonators and appalling black velvet paintings on display can make him seem little more than a perverse and distant memory. But before Elvis was camp, he was its opposite: a genuine cultural force. … Elvis’s breakthroughs are underappreciated because in this rock-and-roll age, his hard-rocking music and sultry style have triumphed so completely.” Not only Presley’s achievements, but his failings as well, are seen by some cultural observers as adding to the power of his legacy. Sadly Prescription drug abuse severely compromised his health, and this together with poor diet led to his sudden death in August 1977 at the age of 42. Despite this Elvis Presley remains a supreme figure in American life, one whose presence, no matter how banal or predictable, brooks no real comparisons, The cultural range of his music has expanded to the point where it includes not only the hits of the day, but also patriotic recitals, pure country gospel, and really dirty blues. Elvis emerged as a great artist, a great rocker, a great purveyor of schlock, a great heart throb, a great bore, a great symbol of potency, a great ham, a great nice person, and a great American.